Hitting 101: Swing Down on the Ball? Nope. One of the sillier notions regarding the act of hitting a baseball is the idea that batters should “swing down on the ball”. I remember having this cue drilled into my head as a young hitter, and I still hear it from time to time nowadays. The reasoning that coaches give for this is the fact that a downward swing angle will create backspin on the baseball, which will help the ball carry farther, whereas an upward swing path will create topspin, which will result in less distance. 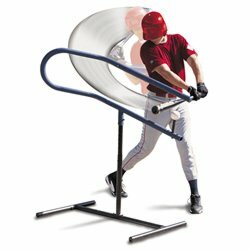 In fact, there’s even a batting tee endorsed by Ken Griffey Jr. called the Instructo Swing, which forces players to hit down on the ball. If you don’t have a downward swing path when using the Instructo Swing, you are rewarded by smashing your barrel into a piece of blue metal. But if we look at Ken Griffey Jr’s real-life swing, do we see that kind of downward swing angle? If you’re good at reading context clues, you already know the answer. Training programs and goals must change throughout the offseason. At the beginning of the offseason, training is dedicated to improving strength and fixing imbalances incurred during the season. As the season approaches, training programs for baseball players should transition from strength-based to power-based, and more emphasis should be placed on sport-specific movements and drill work. Many younger ballplayers who have not yet reached high school are in the middle of their “pre-season” training phase right now, as outdoor practices have begun and regular season games are right around the corner. This means that they are doing a LOT of explosive drills like medicine ball throws to improve their ability to use the strength they’ve gained over the winter.